There are a number of news stories like this (in Russian) of an iPhone 5 burning up and causing a fire while charging overnight, seriously damaging the owner. 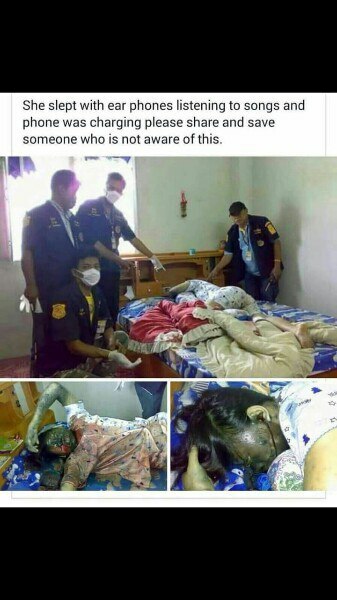 There's another story going around of a girl dying because she was listening to her headphones overnight while the phone was charging, whereupon the phone unexpectedly ignited. These stories seem slightly far-fetched to me (the girl in the image seems to have injuries that couldn't be caused by headphones), and the sources for them don't seem particularly reputable. Is there any credible risk of leaving your phone charging overnight or dying because of listening to music on your headphones while the phone is charging? Lithium batteries are based on a chemistry that can fail in combustive fashion. To avoid this, elaborate safeguards are in place to avoid those exact failure modes. A defective battery can still self-ignite, though. This can happen in a variety of ways. The electronics avoiding overcharging could be damaged. The battery could be physically damaged. There could be a construction defect. Generally speaking, overnight charging or overnight use is no more dangerous than daytime charging / use. Yes, you might be asleep, but at the same time the environment is very quiet, and you are more likely to be alerted to a violently exothermic reaction happening on your nightstand than during noisy daytimes. Factoring in all the failure modes that are more likely to happen at daytime -- your phone falling down, the battery being bent or pierced by something etc. -- charging your phone overnight is no more dangerous than charging, using, or carrying it at day. No. The module that controls the rate of charge and whether any charge is drawn from the power source and the AC power adapter resides in the iPhone, itself. As such, it's really not possible to "overcharge" a modern smartphone. Popular Mechanics says that lithium-ion batteries don’t overcharge, and instead will “trickle charge.” This happens when the battery reaches 100% and the charger vastly slows down the voltage that it sends to your iPhone, just enough to keep it charged up without overcharging. GottaBeMobile: Can you leave your iPhone charging overnight? This process charges the battery as quickly as reasonable while protecting the battery from damage or increased wear and tear. Please note that the charging IC - or Power Management IC - is located inside the iPhone. So this applies regardless of the external USB powering device you use to charge it. When the battery is full, the charger turns off the charging process. The battery is left alone without current going into or out of it. This is because most Lithium chemistry batteries don't like trickle charging (a process you may hear from others where a constant voltage and low current is applied to a battery all the time to keep it topped off). Charging ICs therefore turn the current completely off and power the phone itself from the charger. This is the only time the battery isn't charging or discharging - when it's full and the phone is plugged in. ..... Conclusion: The phone and its battery, therefore, will suffer absolutely no damage being plugged in for days at a time. StackExchange AskDifferent: Is charging iPhone all night harmful to my iPhone? Now, these references are specific to the iPhone, but the technology (despite Samsung's previous battery issues) is similar or equivalent between most modern phones. Charging you phone overnight is safe, as long as you are sensible. It should be on a hard surface and have adequate room for any heat to vent. All rechargeable batteries have a risk of causing injury if they are misused or they are faulty. https://en.wikipedia.org/wiki/UPS_Airlines_Flight_6 and there was a problem with the Boeing Dreamliner https://en.wikipedia.org/wiki/Boeing_787_Dreamliner_battery_problems. Not the answer you're looking for? Browse other questions tagged technology sleep .